The Netherlands felt too good to be true. Cyclists are prioritized over cars. The bike infrastructure is safe and I never had to worry about a car hitting me. The lanes are clearly marked. The road signs are clear, even for those that do not understand Dutch, like me. However, sometimes one is not sure if a sign means that cyclists are being prioritized or if vehicles can run over cyclists, as is seen in Figure 1 below. The cherry on top? 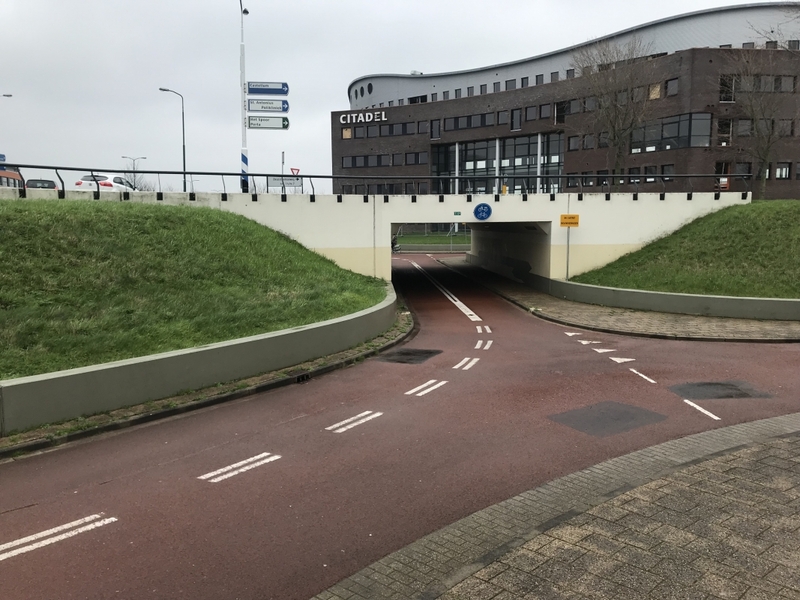 The Dutch have an almost car-free town, where cars are guests and should not enter the town unless they absolutely need to. For example, if mail is being delivered or if one resides in the town. Additionally, overall, I felt healthier while in the Netherlands. Beginning my day with biking made me feel energized and by biking all day, I felt more ready for bed. It was evident that cycling helped me sleep better at night. How does design differ from the US? 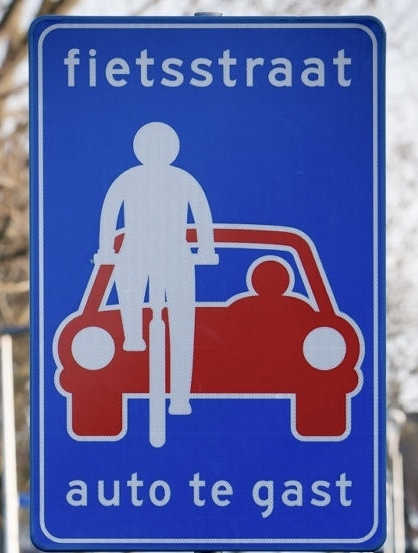 Overall, the main difference in design is based on the fact that the Dutch prioritize cyclists. This has influenced their design choice of separation rather than integration of bikes and motor vehicles, as is seen in the United States. This separation causes cyclists to feel safer which yields a higher percentage of utilitarian cyclists. Not only do the Dutch aim for separation and safety, but they also take into account speed and distance. Roundabouts, speed bumps, curves, and narrow roads are examples of infrastructure that have been constructed in order to control speed. When cars are driving at a slow speed, cyclists feel safer to share the road with motor vehicles. On the other hand, in the Netherlands, cyclists and motor vehicles are typically separated when the speed limit for cars is significantly high than the average speed of a cyclist. 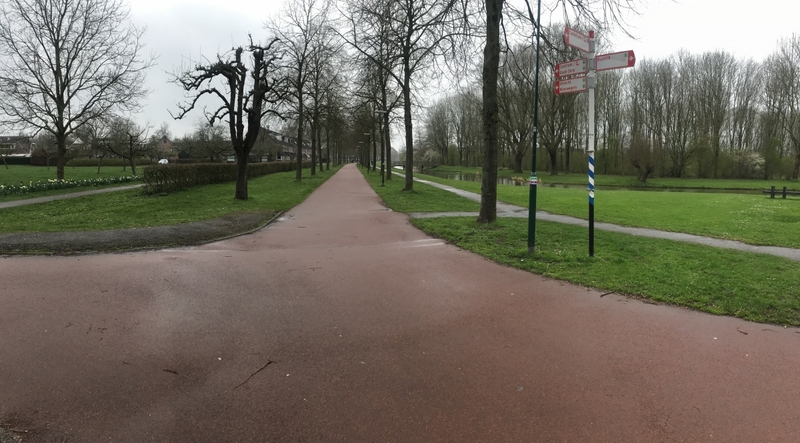 The Dutch separate the two by having cycle tracks which are brick-red in color. They may also be grade-separated. In terms of distance, for longer distances, transit plays a huge role in that cyclists are able to carry their bikes on board trains. However, if a cyclist wishes to bike to a far destination, the infrastructure is accommodating in that bike infrastructure continues throughout the country. The Dutch were tired of people, especially children, dying as a result of road accidents and thus fought and pushed for safer roads and alternative modes of transportation. The government listened to its citizens and moved towards biking and advocated for bike infrastructure that is safe and efficient for cyclists. This design has influenced Dutch culture in multiple ways. Because it is safe, efficient, and accommodating, people of all demographics can be seen biking in the Netherlands for any purpose. Dutch children bike to school, adults bike to work, and teens bike to visit their friends. 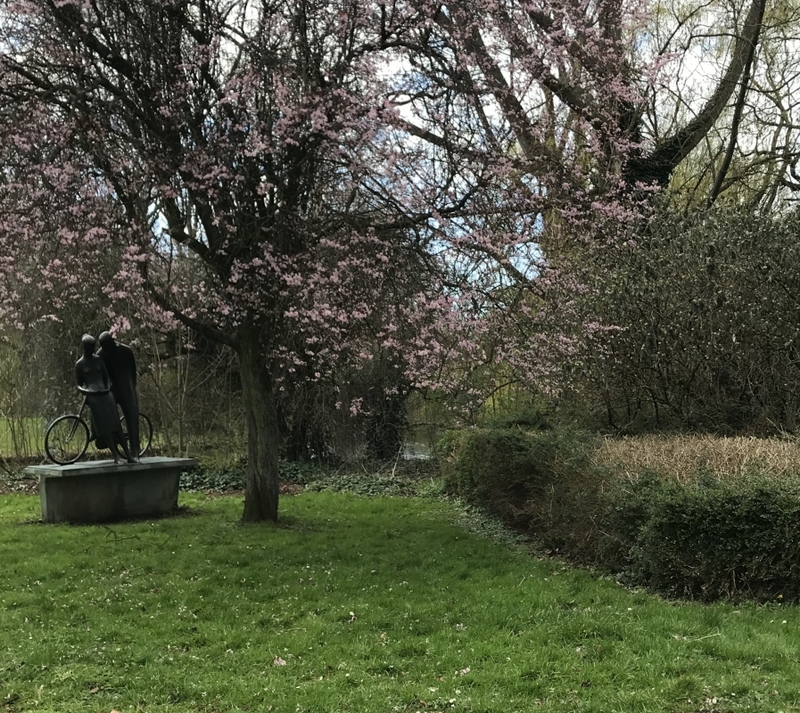 While on a bike tour in Amsterdam, I remember learning that the Dutch strive to make bike infrastructure safe for an 8-year-old and an 80-year-old. This is because if it is safe for the young and the old, who are the most vulnerable, then it is also safe for everyone else. Another important thing to note is that cars and fuel are more expensive in the Netherlands, which makes driving expensive and less-convenient than in the U.S. While in the Netherlands, I learned that it costs approximately 1000 euros to obtain a driver’s license in the Netherlands, which is drastically different from the $20 that it cost me to obtain mine in Atlanta, Georgia. Not only that, but the Netherlands is a small, flat country which makes it easier to bike than in the United States. Finally, the Dutch are heavily influenced by the fact that most of the Netherlands lies below sea level. Therefore, they continuously strive to be a sustainable nation. All in all, the Netherlands is a beautiful country with beautiful people and splendid bike infrastructure, and I am ecstatic to return one day. Admire the beauty and serenity as is seen in Figure 3 below. From what I have gained so far, the Dutch will do almost anything, if not everything, for cyclists. The integration of bikes and transit seems like a piece of cake to them. Basically, one cannot think of transit in the Netherlands without thinking of bikes. 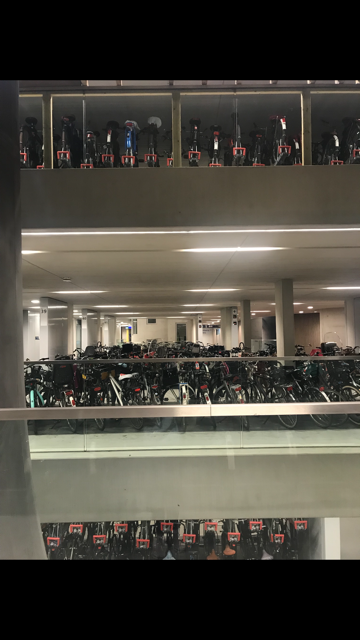 The two main ways that the Dutch integrate transit and bikes is by allowing bicycles on trains and by having bike parking at train stations. Train stations have bike shops and bike parking where one can rent a bike, fix bike malfunctions, or even park their bike. 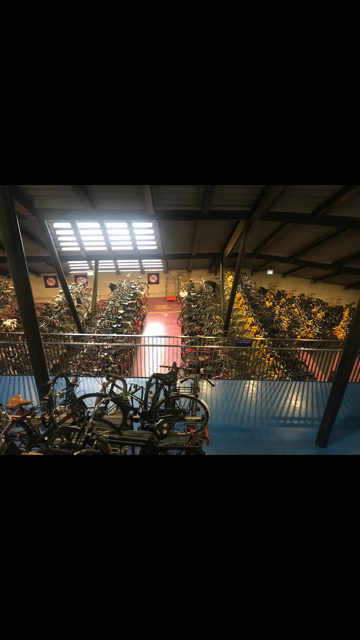 Figure 1 and figure 2 below show the world’s largest bike parking with a full capacity of 12,500 parking places found in Utrecht. The bike parking are convenient for cyclists in multiple ways. 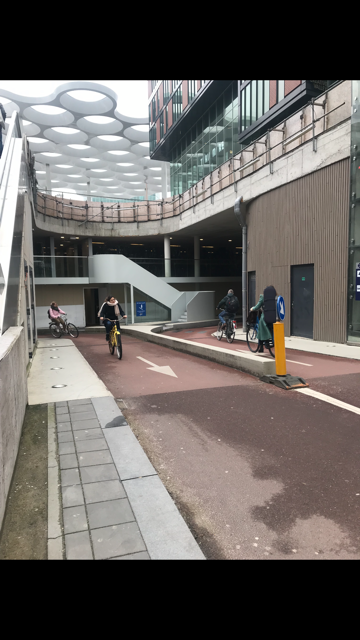 First, there are no stairs inside the facilities where cyclists bike, maybe one step to prohibit biking in dangerous locations such as entrances. The absence of stairs and presence of ramps make it easy for cyclists to navigate the bike parks. Additionally, narrow pathways, turns, and curves slow down cyclists which prevents speeding and, in turn, accidents from occurring. So, how come the Dutch are so invested in biking? 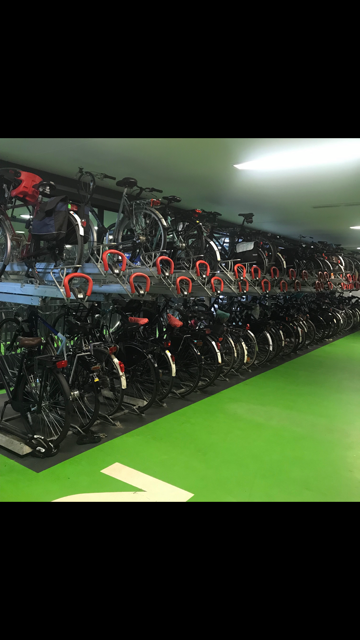 How come they can have a bike parking facility with 12,500 bike parking spaces? Well, that is because the Dutch practice utilitarian cycling. They are able to do this because of the safety factors that have been put in place. If it was not safe to cycle, then the cycling rate would not be as high. If the cycling rate was not as high, then I do not think that the government would push for bike infrastructure as much. The Dutch measure transit performance using speed and reliability. For bikes, speed includes how long it takes a cyclist to get from point A to point B using the shortest distance possible. In addition to this, for public transit, it also includes dwell time. Speed decreases as operational time increases. Operational time may increase due to numerous factors such as dwell time, and inefficient use of vehicles and driving staff. Dwell time increases due to ticketing on the trams. For both cyclists and public transit, speed and reliability can be increased by redesigning streets, placing priority traffic signals, and canceling stops and transfers for buses, trams, trains, and the metro. By minimizing the wait time, transit has been made more reliable and responsive to create the safest and most efficient plan possible. A city in which cars are guests on the road! Welcome to Houten! 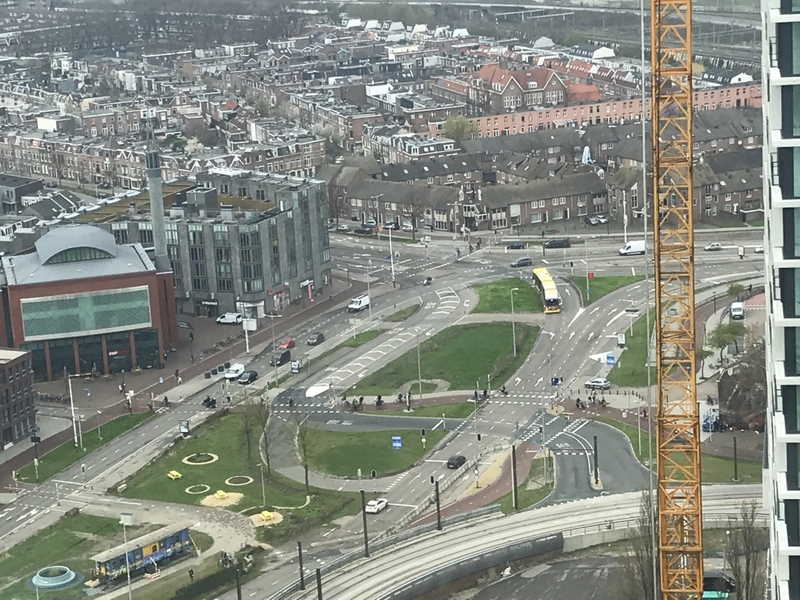 Most of us think that as trains are on tracks, so are cars on roads, but Houten thinks otherwise. In the 1960s, Houten was identified and picked by the national government for development so that it can accommodate the growing population of the Netherlands. Starting from scratch, plans for Houten were drawn on paper and supported by locals. It was time for the village of Houten to become the city of Houten. A big part of the discussion included how to deal with traffic. Considering the environment and safety, it was concluded that the city’s design would prioritize cyclists and pedestrians by providing them with more direct routes than the limited routes that would be provided for vehicles. These indirect routes would make it difficult for vehicles to enter into the city. This was accomplished by designing two outer ring roads in the figure-of-eight shape for car traffic. In fact, cars are guests on the paths within the city, as is depicted by the many road signs on the road, similar to the one shown in figure 1 below. Figure 1. A road sign stating that bicycles are priority and cars are guests on the road. On some sections, cars and pedestrians are further separated with each having their own path in order to reduce commotion and eliminate accidents. Pedestrian sidewalks are parallel to the bike paths, as is shown in Figure 2 below. Figure 2 also shows that the bike paths are colored brick-red. Figure 2.Brick-red bike paths and separation of cyclists and pedestrians. To further restrict cars from entering, there are narrow roads in addition to low speed limits. There are also multiple speed bumps and sharp turns to slow down vehicles. Other interesting cycling infrastructure that we saw include the two-tiered round-about shown in Figure 3 below. The lower level is to be used solely by cyclists while the upper level is for motor vehicles. There is also the greenbelt, shown in Figure 4, which is green space that one can get to either on foot or by cycling. Something similar in the U.S.? “Cycle tracks are like Art in the Netherlands, and Science in the U.S.,” said one of my classmates earlier today while we were on the bike facilities tour. As I pondered on this for a while, I realized that this sums up my initial feelings about Dutch bike infrastructure. Art appeals to one’s emotions, intuitions, and intellect. While riding to Delta Works in Maeslantering, it became challenging after about an hour. In fact, I remember asking April, the Teaching Assistant, how much longer we had, only for my soul to crash at her response when she reluctantly said, “About an hour.” It was at that moment that I decided I would simply enjoy the scenery and enjoy the journey rather than think about the destination. Although I was undoubtedly exhausted, the suitable biking infrastructure that changed throughout made it more interesting. In terms of design, it is evident that cyclists are prioritized. There is bike infrastructure on almost every road. 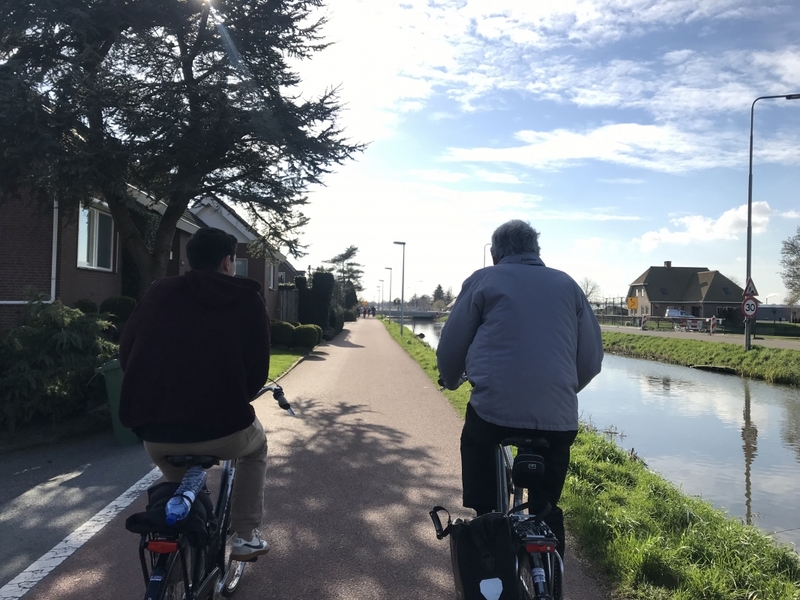 On our way back to Delft from Maeslantering, there was a stretch of road where there was no bike infrastructure – no cycle track, bike lanes, or advisory bike lanes. However, this was on a country, residential road without heavy vehicle traffic. When it comes to traffic signals, most, if not all traffic signals, include signals for cyclists, pedestrians, and motor vehicles. I was especially surprised to see a turn signal for cyclists. Another major design difference is in the color of bike infrastructure. In the U.S., the pavements on bike lanes and cycle tracks are painted green, while they are red in the Netherlands, as shown in the image below. 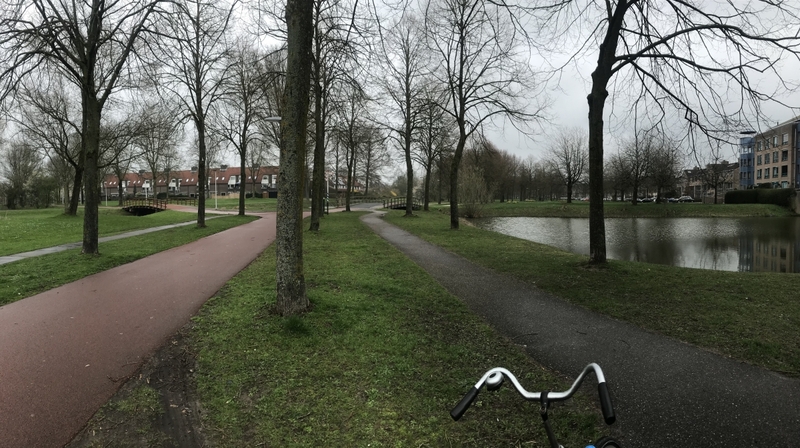 In the Netherlands, where roads may also be red, I realized that the roads and bike paths are paved using different materials. In this case, the roads were bumpier. This may not only be to further distinguish between the two but to also slow down the vehicles. 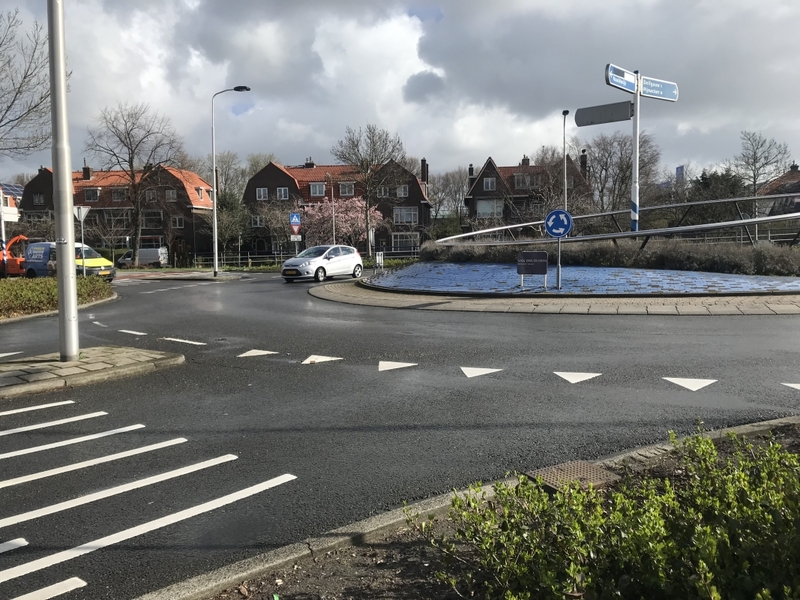 Also, because bikes are prioritized, roundabouts are more common in the Netherlands than in the United States. Roundabouts are beneficial because cyclists can continue their journey, they improve traffic flow, and improve safety. An example of a roundabout that we saw during our tour is shown below. It is also clear that cyclists are prioritized with the construction of bridges and tunnels. During the tour of the bicycle facilities today, we were able to see a bridge that was constructed in order to shorten the travel distance and more easily connect one side from the other. Tunnels are also constructed for the same reason. However, if not to cross a body of water, tunnels may be preferred due to many reasons. There is a shorter height clearance required for tunnels as only the height of the cyclist is taken into account. A tunnel is also not as high as a bridge and thus requires less work from the cyclist, in terms of biking uphill. Without these bridges and tunnels, cyclists would have to travel much further than they need to. Cycling is part of Dutch culture. It is part of who they are. It is part of their lifestyle. The Dutch use bikes to get to work, wearing a dress or suit. They use bikes to rush to their 11 am lectures or to transport their children to school. They also use bikes to get to the grocery store, to list a few. I have seen young children rushing home after school on their bikes. I have also seen elderly people biking. It is so deeply rooted in their culture that, when I am speaking to locals and share with them that I am here to study Dutch bike infrastructure, they look astounded. In the Dutch culture, cycling is a usual mode of travel that is cheap, convenient, environmentally-friendly, as well as good for heart health. They love cycling, as is portrayed in the image below. It is this beauty that makes cycling in the Netherlands like Art, although plenty of Science has gone into making it the best in the world. After completing the readings, I was constantly thinking of how I can implement policies similar to those in the Netherlands, Germany, and Denmark both in the U.S and in Kenya. I realized that even as a pedestrian, it is difficult to move around in the U.S. without a car. Numerous topics that were mentioned in the readings interested me. I was first surprised by the “Vehicular Cycling Theory” proposed by John Forester which opposes the separation of bicycles and motor vehicles. Additionally, I was impressed to learn that women account for the majority of cyclists in Copenhagen compared to men in the United States. It was also impressive that the Netherlands, Denmark, and Germany implement safe cycling courses in school. This way, starting from a young age, citizens are aware that pedestrians and cyclists are prioritized. Finally, it is interesting that there is really no correlation between wealth and cycling. In fact, the Dutch are affluent people and almost every household owns cars. I find that to be interesting because, in Kenya, there is a notion that cycling is for the working class, best explained by the quote “I’d rather cry at the back of your BMW than laugh at the back of your bike.” While the Dutch are more affluent and bike more than Kenyans, cycling is viewed as a symbol of poverty by many in Kenya. 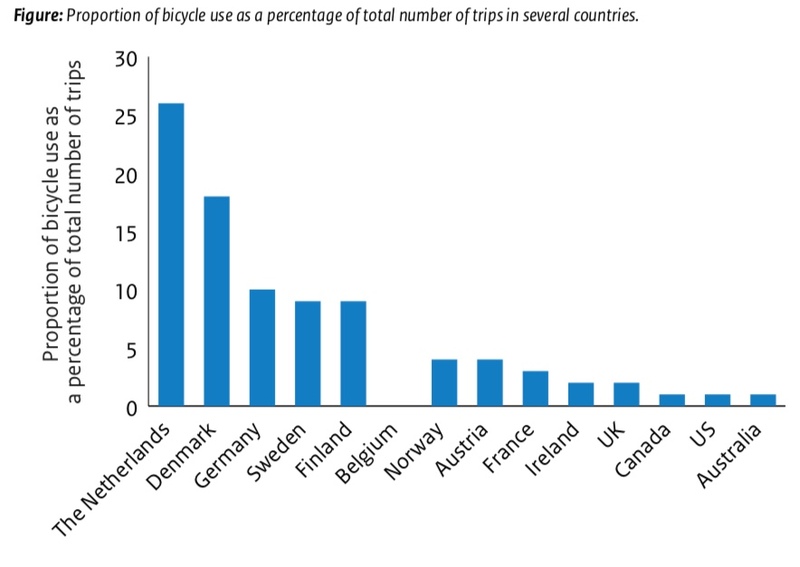 It is evident that the importance of cycling is recognized in Western countries. Not only is cycling good for the environment but it is good for human health and is more economical and requires less space than motor vehicles. The two groups of countries differ in how they classify and portray the importance of cycling. In Europe, driver’s training courses emphasize the importance of protecting the vulnerable, who are seniors and children. In Western Europe specifically, it is expensive to get a license which costs about €1000 to €2000. In the U.S., on the other hand, it is cheap to get a license and the importance of not endangering cyclists and pedestrians is not stressed. In North America and Australia, speed limits in residential areas are much higher and traffic calming is limited to a few streets. It is also important to note that in both regions, the national government is responsible for funding, traffic regulations, and roadway and bikeway design standards while most cycling safety policies that increase cycling and make it safer are implemented at the local level. The standards set by the national government vary in content, level of detail, legal status, and financial commitment, and provide a vision that can guide lower levels of governments in their own effort. I think these differences are why cycling is thriving in some countries and struggling in others. Some countries are not specific and do not state quantifiable goals, while others such as the Netherlands are specific and thriving as shown below. In the 1950s and 1960s in Europe, with an increased urban sprawl and increased motorization levels, there was less cycling. There was a heavy focus on expanding roadway and parking, which favored car use and thus saw a rise in environmental pollution, roadway congestion, and traffic injuries and fatalities. Therefore, policies changed to minimize car use and promote public transport, walking, and cycling. To further restrict car use, there are traffic-calmed neighborhoods, car-free zones, and raised taxes on car ownership, use, and parking. To educate the general public, bike training and safe cycling courses are taught in school for children. There are also information and promotional programs such as free printed bike maps, some of which are interactive and available online, that permit trip planning. 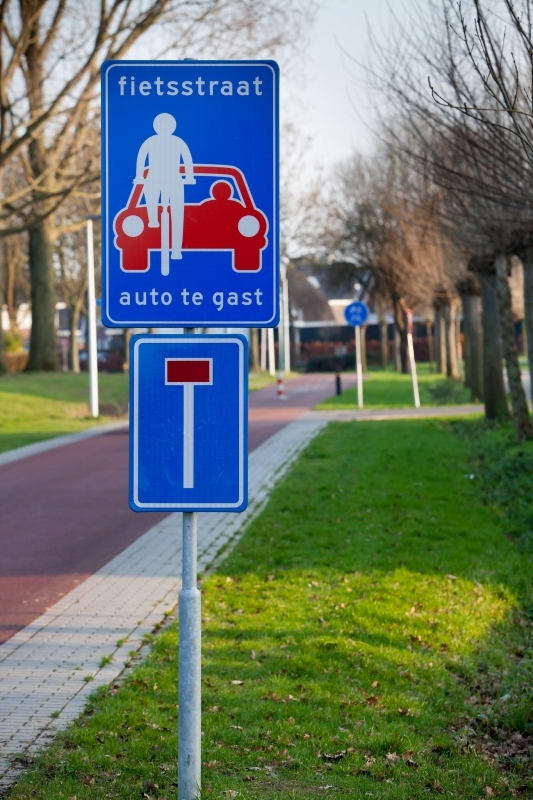 To be more bike-friendly, the Dutch expect physical separations as follows. A rural road whose speed limit is 60 km/h + (37 mph). The biggest issue in the U.S. is that there lacks a separation criteria, which is what mostly defines Dutch cycling. There is no criteria for when cyclists should be separated and no limit to traffic speed or the number of lanes. In general, the government tends to prefer the lowest-cost solution. So the government would rather save money rather than make cycling safe so that more people may opt for cycling. This is probably why Forester proposed his theory, because if cyclists would not need lanes, then that means the government does not need to provide funding. According to his Vehicular Cycling Theory, separation causes greater risk except where there are no intersections. He suggests that it is safer to ride where motor vehicles ride because that is where motorists are going to look. However, this greatly ignores research that accounts for what has been implemented and works, especially in Europe. This also ignores data that suggests most people who would rather not cycle do not do so because they are traffic-intolerant and would rather not compete with motor vehicles on the road. It is also crucial to note that bicycles are not cars and therefore do not benefit from cage-construction, crumple zones, or airbags, which is why the safety of cyclists must really be considered. In conclusion, the importance of cycling to the environment, health, and transportation is recognized and in order to achieve this, the masses must be appealed in addition to the traffic-tolerant. The greatest concern for cyclists is safety and comfort, which separation of motor-vehicle traffic and cyclists can achieve. Since trends begin in urban areas, it may be beneficial to popularize cycling where it is not popular starting in urban areas, which also happen to be the places with the most vehicle traffic and more congested roads. Urban area are comprised of a greater mix of incomes, races/ethnicities, educational attainments, and lifestyles. However, outside Europe, cycling is not distributed evenly among different demographics. For example, older people do not typically bike. Urban areas have more younger populations and economic and societal trends. Cycling will help because it requires less space, which results in less congestion, less crowding during peak hours. Not only that, but bikes are less polluting and less noisy. Even though there will be greater competition for public transportation, people would have cycling as an option. Pucher, J. R., & Buehler, R. (2012). City Cycling. Cambridge, MA: MIT Press. Before one asks what the importance of mentoring is, it is important to first understand what mentoring is. Mentoring is when a more experienced person advises a younger or less experienced person by sharing one’s knowledge and experiences. This is in hopes that the mentee will be better equipped to tackle what life brings and progress in their life to reach their full potential. However, mentoring is not simply being told what path to follow nor is it following in the footsteps of a person that has been where you are at the moment and is now successful. This is simply because every person is different and what worked for another person may not work for you. Mentoring is important for various reasons. According to the University of Washington, a good mentor is personable and provides feedback, encouragement, has your best interest at heart, fosters a network, and demystifies what may seem as grandiose (UW 2019). This is especially important and academic aspects and in career fields. All in all, it is important to not walk alone especially if there is someone who may be able to guide you. One mentor or a mentoring team? A peer or a faculty member? Essentially, the more mentors one has, the more advice and guidance one can receive. When finding mentors and determining whether a team or a single mentor is more suitable for you, it is important to realize what role each mentor will play in your life. Therefore, it is essential to first build a vision of the type of mentor you need, whether a disciplinary guide, career consultant, or a skills development consultant, as those are the three core roles that mentors play (UW 2019). There are numerous aspects of finding a good mentor and working with them. First, identify and seek multiple mentors. Next, be proactive: approach your potential mentors and spark conversations. It is crucial that potential mentors see the interest and want to mentor you, which means that you need to be proactive, take initiative and be responsible for building relationships. Show commitment by investing time and being clear and professional in your approaches. So now you have your mentor, what next? What can your mentors offer? Availability: It is important to determine how often your mentors will be available to you and how you will maintain contact. Communication: How are you and your mentors going to effectively communicate? Do you feel comfortable with them? Workload and financial support: Do they have or know ways to support you? Publishing: Are they willing to help you publish your work? What contacts do they have? In general, leaders are confident, visionary, possess critical thinking skills, and work towards reaching a goal. A collaborative leader is aware of themselves and others, seeks feedback, and is culturally sensitive. When it comes to awareness if a leader is not aware of who they are, how can they lead others? On the other hand, if one does not know who they are working with, how can they lead them? It is merely impossible to work effectively as a leader if you are not self-aware and aware of those you are leading. Not only that, but a collaborative leader seeks feedback in order to become better and understand how they are perceived, which fosters growth (Vora 2014). A leader grows to lead people from all walks of life with unique backgrounds. Not only are cultural awareness and sensitivity crucial, but so is emotional intelligence. With these traits, a collaborative leader is able to be personable by building meaningful connections with team members. Providing feedback may seem like a dreadful task due to the negative connotation associated with it and the increasing diversity in professional situations. However, nobody is perfect and feedback is essential for growth. Feedback makes relationships more functional and drives productivity. If one truly cares for another, feedback can make the other person feel valued and closer to you, if done correctly (Robin 2013). That brings up a good point, how do you do it right? Provide feedback early: In order for the person not to repeat the same thing over and over again. Avoid shaming and be generous: Be respectful of others. Focus on behavior: Behavior is learned, but personality is not. Provide feedback from your aspect: State facts from your point of view. Use first person rather than second person when providing feedback. The increasing diversity in professional situations may cause people to be confused about how to efficiently provide feedback without being offensive to the other party. Some cultures, like the British, use “downgraders” when providing negative feedback in order to soften the situation. Meanwhile, other cultures use “upgraders” (Mayer 2015). All in all, being authentic to oneself while being sensitive to other cultures is ideal. Hello! My name is Serah Mungai, and I am from Nairobi, Kenya. 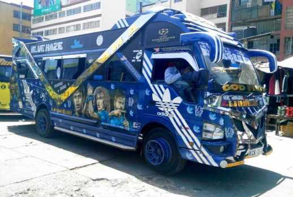 I am from a city known for matatus, vibrant minibuses with blaring music. 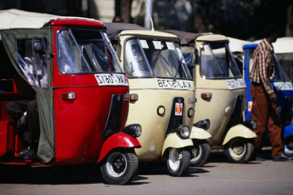 Buses, trains, taxis, boda bodas (motorbikes), and tuk-tuks (three-wheeled taxis) are also a common means of transportation in Nairobi. 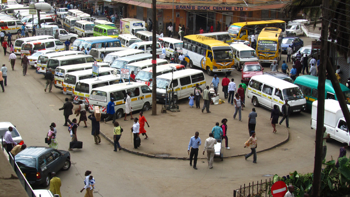 Nairobi is also known for having creative drivers, who create four lanes on a road meant to have two lanes, find a way to maneuver through heavy stand-still congestion, and who treat traffic lights as a suggestion. Due to this, walking and cycling are not advised. However, in the city center where it is difficult for vehicles to move around, most people walk. How have my travels influenced my thinking on transportation? Growing up in Nairobi and studying abroad in Paris has greatly influenced my thinking about transportation. While in Paris, transportation was very reliable as I took the Metro daily to and from class, and around the city. Coming from Atlanta, it was also a relief to see the amount of people that relied on the Metro, and the amount of people that either walked and biked. While studying abroad, I only used Uber three times. Two of those times were to get to and from the airport when I was traveling to Nairobi, and once when I was returning to the States, because I had too much luggage. While I was studying in Paris, I visited Amsterdam. It seemed as if every person was biking, young and old, men and women, whether going to work or to the grocery store. This trip greatly influenced my decision to study sustainable transportation and apply it locally, both in Atlanta and Nairobi. I am excited to learn how the Netherlands has managed to be a bike-friendly city. I also look forward to being mentored by professionals in applying this to the streets of Atlanta. I am also excited to return to Europe and learn in the city which this course is based on, and see it for myself rather than only read about it. Bike facilities in Atlanta do not make me feel comfortable about biking in Atlanta. It makes sense why “you are 30 times more likely to get injured in the U.S. than you are in the Netherlands,” according to Wagenbuur (2011). 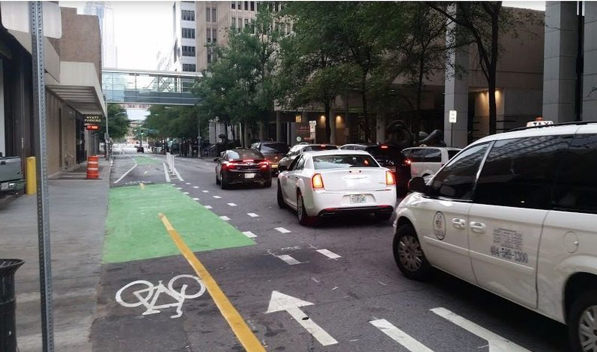 In Atlanta, bike safety does not seem to be a priority, hence why bike lanes have not been implemented on every street and cars may park next to, or on, bike lanes with door zones not being flexible with cyclists. Where bike lanes are, they are not completely separated from vehicle lanes. There are bike lanes, literally lines drawn on the road, but no physical boundaries. This is especially noticeable in the city. At one instance while on the bike tour, I felt as if vehicles turning right would hit me. There are some locations that we biked through in the city that I felt safe, like the one depicted in Figure 1 below, due to the bike lane that is clearly separated from vehicle traffic. In Midtown and other parts outside Downtown (ie: 10thStreet), on the other hand, bike facilities are more accommodating to cyclists. Multiple factors, such as quiet neighborhoods and designated bike lanes with physical boundaries, may contribute to this factor. 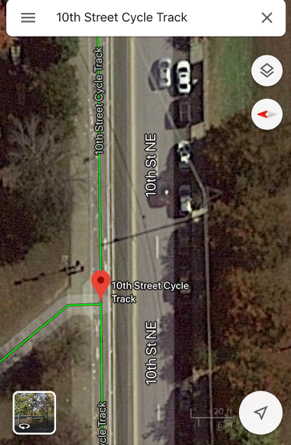 More specifically, Georgia Tech is more accommodating to cyclists with Ferst Drive having a bike lane along the entire path. As shown in Figure 2 below, 10thstreet is also accommodating. While on the bike tour, I did not have any fears relating to biking while cycling down 10thstreet and into the Beltine. In general, I doubt that most people would feel comfortable cycling around Atlanta’s infrastructure, especially in the city. The Georgia Tech campus and Midtown are exceptions, however. In the U.S., cycling is viewed as an activity for children or as a leisure activity. In fact, people carry their bikes on their cars in order to get to their destination. Meanwhile, in the Netherlands, cycling is perceived as the primary mode of transportation, whether transporting children to school, heading to a business meeting, paying a friend a visit, or going on a date. In the Netherlands, there is no specific bike gear, one can wear whatever one wishes, as biking is not a leisure activity, but a reliable mode of transportation for a person of any age. Additionally, in the Netherlands, it does not seem as if bikes are compete with traffic or as if cars invade bike lanes, as cyclists are prioritized. In fact, vehicles may be seen as “guests,” as mentioned by Dr. Watkins in lecture. Compared to the U.S., it may take a cyclist a shorter amount of time to reach a destination than a vehicle driver as roads are meant to be accommodating to cyclists. In most countries, at crossings, first the car lanes are drawn followed by bike lanes that cause bikers to cycle as fast as possible, which is where protective islands emerged from. Junctions are designed in this way so that cyclists do not mix with vehicles, causing accidents and injuries. 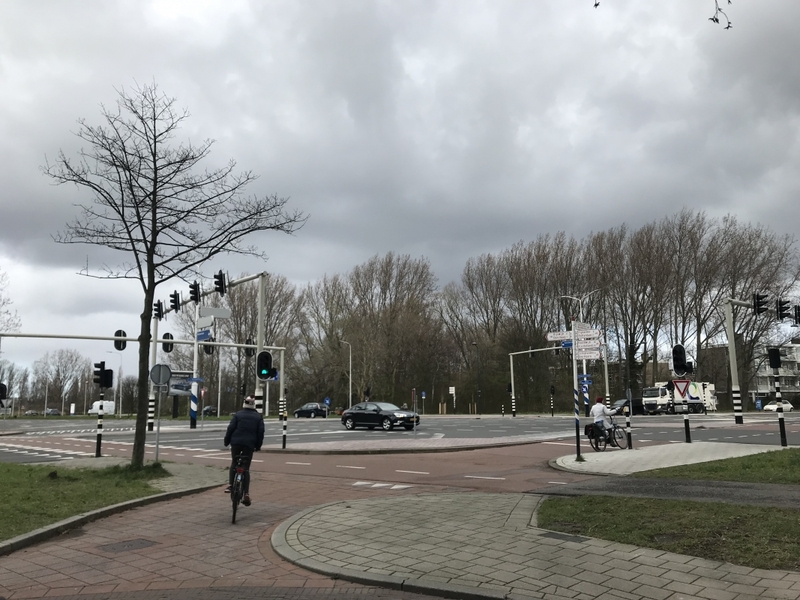 However, roundabouts are more common in the Netherlands as they have proven to be safer for cyclists. Cycle tracks can be placed all around them, prioritizing cyclists and making traffic flow better. Additionally, they slow down motor vehicles, making them safer for the environment as well, as they minimize noise pollution (Wagenbuur, 2014). After WWII, the Dutch had to rebuild their country. They became an extremely wealthy people and plenty of people started owning cars. There were so many cars on the road that buildings had to be demolished for parking. As the number of cars on the road increased, the number of bikes decreased, and accidents saw a rise. The Prime Minister advised that Sundays become car-free to raise awareness that cars were decreasing quality of life. For example, over 3300 people, of which more than 400 were children, died in 1971. (Wagenbuur, 2011). After all, bicycles were welcomed and cycle lanes were welcomed. Therefore, in my opinion, cycling infrastructure developed in the Netherlands due to the amount of space that cars required, and more importantly due to the number of children (more than 400 per year vs. 14 in 2010 - Wagenbuur 2011) that died because of being hit by cars. People were angry and outraged and wanted change. They wanted an alternative mode of transport, especially one that would not rob them of their loved ones. In the U.S., on the other hand, many cities have been influenced by Davis, California (Schmitt, 2018), and other international cities to adopt bike lanes and be bike-friendly cities. Additionally, even though bikes are not as expensive as cars, bike lanes are more common in wealthier neighborhoods and near the beach. This is probably related to the fact that, in the U.S., cycling is viewed as a leisure activity. Additionally, in my opinion, biking is seeing a rise, especially in younger people, because of the need to keep healthy and stay fit.